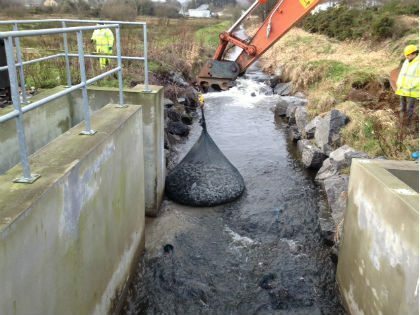 Over the past few years the Rivers Agency has been utilising the filter units system for a number of different projects throughout Northern Ireland. The most recent of these was temporary application to protect the foundations of an abutment which had been experiencing high volumes of water due the winter season rainfall and the overflow from Camlough Lake. Excessive flows of water have resulted in the abutments being undermined causing instability in the structure therefore requiring immediate attention. The space at the work site was very limited only allowing enough room for one excavator to manoeuvre. This made it very easy to install the filter units at the base of the abutments and also along the base of the rock armour that was also becoming unstable. The filter units have a naturally flexible nature which gave the Rivers Agency an accurate and easy way to temporarily protect the structure in a short space of time. The plan going forward at the site is to remove the filter units, replace the entire structure and reuse the filter units to replace sections of the rock armour along the river banks, this also displays the versatility and cost effectiveness of the filter unit for river and bridge remedial works.